Report all of your volunteer hours! Do you prefer to report your hours via an Excel document? Click HERE to download the template, and send it to Chelsea Winer (cwiner@sdsu.edu) once it is complete. There are benefits to reporting your community service hours! 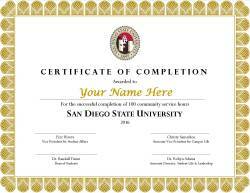 Criteria: If you've completed and reported 50 hours of community service during your time as an active SDSU student, you will earn the 50 Community Service Hours Certificate. Not sure what counts as service? Find out here. 50 Community Service Hours Certificate. Certificates will be awarded during the Leadership & Service End of Year Celebration. Don't forget to put this on your resume under your education or certificates/awards section. Report 50 hours of community service during your time as an active student at SDSU. For more information, please contact Chelsea Winer at cwiner@sdsu.edu. Click HERE to see a close-up design of the pin. 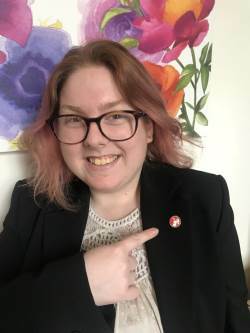 Criteria: If you've completed and reported 100 hours of community service during your time as an active SDSU student, you will earn the 100 Service Hours Lapel Pin. 100 Service Hours Lapel Pin. Pins will be awarded during the Leadership & Service End of Year Celebration. Report 100 hours of community service during your time as an active student at SDSU. For more information, please contact Chelsea Winer at cwiner@sdsu.edu.